This is a brand new folding larsen / corvid trap, it has either double side entry for crows or double top entry for magpies. 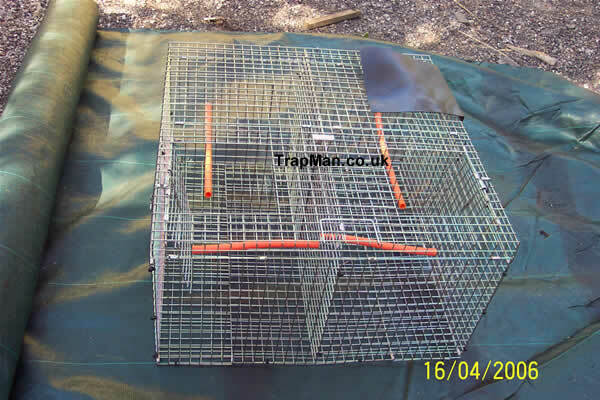 Half the trap is used for the call bird and the rest is divided into two catching cages. Change over from one to the other is a simple operation taking no longer that two mins. 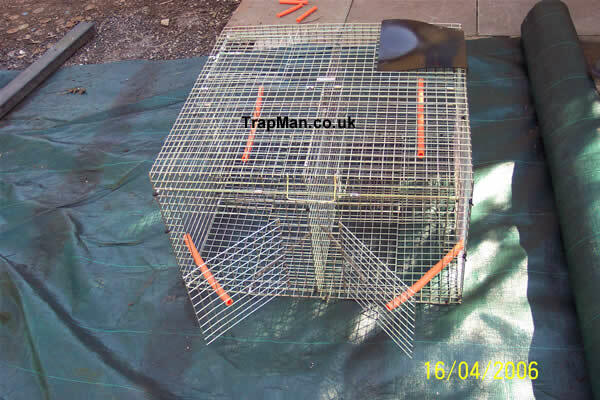 The trap folds down flat and comes complete with two decoy perches and four sets of split perches, decoy water bowl, simple to understand instructions and a 24/7 email help for as long as you own the trap (quote your invoice number) This larsen trap design addresses all the previous problems associated with the larsen trap i.e. storage, transporting, longevity. 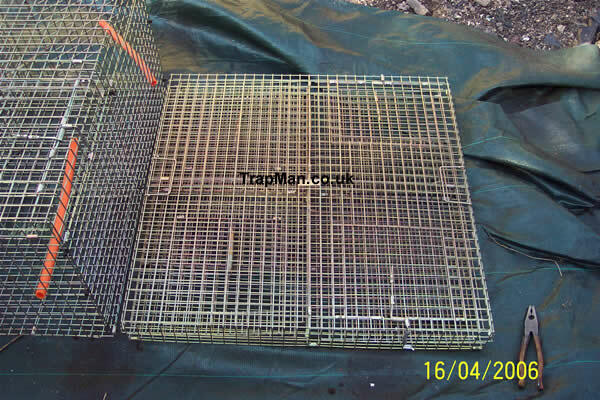 Made from inch square 12gauge welded mesh, this larsen trap is no lightweight that rusts away in the first year of use it will last for many years. This larsen corvid trap can also be used as a multi catch larsen trap without a call bird decoy. 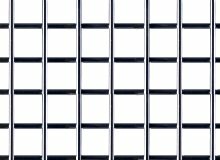 Two larsen corvid traps can be used back to back utilizing one decoy bird in the decoy compartment and 4 top entry capture cages plus an additional two side entry capture cages thus giving a true multi catch larsen trap with similar catching potential as a multi catch crow ladder trap. Setting up is simple place the larsen / corvid trap on the ground with the sprung catching doors at the top, unclip the two ties, grip the two top panel handles at each side and gently lift the trap up to its full size of 18" x 30" x 30", give it a good shake to engage the panels, fit the plastic ties (supplied) to all the abutted panels and finally fit the decoy perch under the rain shade and the other perch opposite it so the call bird decoy will hop between the perches, this will attract other birds to your cage. That's it !, set the spring operated doors with the split perches....your ready to catch......less than five mins from receiving the trap......your ready to catch your first magpie or crow. Catching your fist call bird is the difficult part, bait the trap with broken egg shells, meat scraps, even aluminum foil or mirrored glass sometimes works too. Once caught transfer the bird to the decoy compatment. You MUST provide the decoy bird with food, water, shelter, room to stretch its wings and you MUST inspect the trap at least every day. You may require a license to operate this trap. The larsen trap when not in use must have all doors tied in closed position. The important factor with a Larsen or Corvid trap is that it uses a live decoy bird. Larsen traps are best set during the run-up to the breeding season. and exploits the crow or magpie's strong territorial urges. A live magpie or crow placed in the largest compartment acts as a decoy, while the doors to the smaller chambers are propped open with collapsible perch triggers and baited with an egg or carrion. Incensed by the sight of a stranger, neighboring magpies come to investigate. They are caught when they alight on the split perch and trigger the sprung door.